Figure made of tow and wax, dressed in linen and woollen materials. 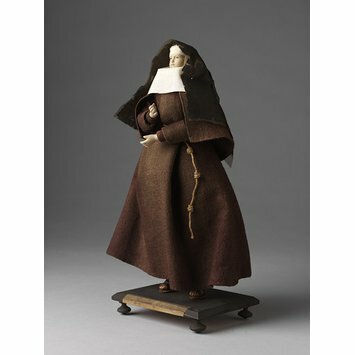 This figure is one of a set of 50 dressed to represent the outfits worn by Catholic religious orders. They are made of tow (hemp) with wax heads, hands and feet. They were probably made in France, as they are labelled in French, but some of the orders represented were only active in Germany and the Netherlands. 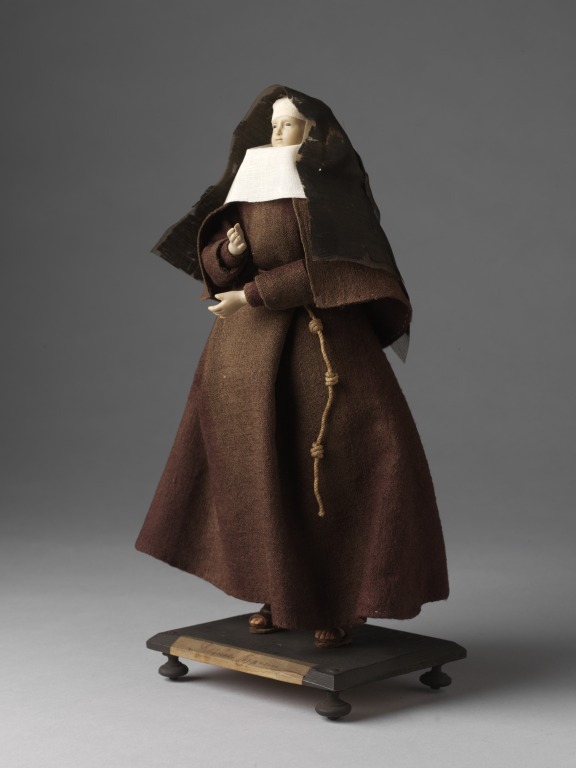 This figure represents a Capuchine nun. The Capuchines, also known as the Capuchin Poor Clares, are an order of nuns founded in 1538 in Naples by Sister Maria Lorenzo Longo. They followed the example of the Order of Friars Minor Capuchin founded in 1520 by Matteo da Bascio (1495-1552) who wanted a return to the extreme simplicity, poverty and austerity of the Rule of St. Francis. Capuchines wear a version of the Capuchin friars' brown tunic and short cape with a knotted waist cord, with the addition of a white wimple and black veil. Figure made of wax and tow, dressed in linen and woollen fabrics. Labelled in French; some of the orders represented confined to Germany or the Netherlands.